April 30th has become a national day to celebrate pets and the impact they have on the people around them. 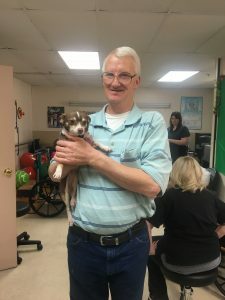 Pet therapy uses dogs or other animals to help patients better cope with health problems and provides comfort and enjoyment for many nursing home residents. “I started working for Therapy Center at Whispering Pines Community Care Center in January 2017. I instantly felt like this is where I was supposed to be. All of the staff, therapists and patients welcomed me with open arms. I started thinking about what I could do in return. The idea of pet therapy came to me as I remembered back to when I would go to my mom’s work at the nursing home. They had pet therapy dogs come at least two times a month, and I remembered the happiness it would bring to the patients. I decided to talk to the administration of Whispering Pines and they were completely on board with the idea! Now every Friday is pet therapy day at our facility,” says Summer, certified occupational therapy assistant. 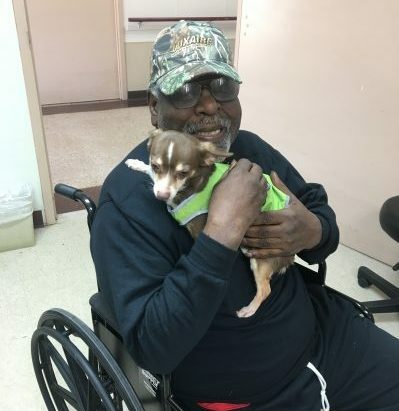 Summer now brings her dog Ginger, a six year old female Chihuahua, to Whispering Pines for the residents to hold and play with during therapy. “I’m not quite sure of her story before I owned her. When she was three years old I found her on an ad on Craigslist and knew I had to have her! She is not your typical Chihuahua. She is calm, easy-going and quiet. She puts not only the patients at ease and makes them excited to come to therapy, but she also goes and visits the residents throughout the facility. One patient even wrote a poem about the joy she brings and how she reminds everyone of home. 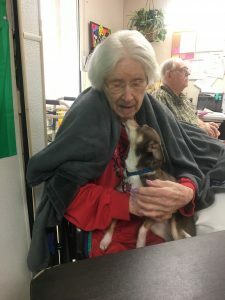 Most of our patients have Alzheimer’s disease or dementia, and when they see Ginger they immediately have a smile on their face and smother her with affection! The joy she brings is extremely fulfilling, and I’m so glad that I’m able to bring Ginger to brighten the residents’ day,” says Summer. For more pet therapy stories from Therapy Center, follow the pet therapy section of our blog.